Last year, Maya and I made bird seed ornaments with some friends in honor or the Great Backyard Bird Count and my girls dragged their plastic Adirondack chairs out to the feeders (which we had put on the border of the woods to protect our small visitors from the neighborhood Red Hawks) and conducted the count from there. So, instead, we decided to do our count this year at the man-made lake in our development where we knew there were lots and lots of birds. Let me repeat that: lots and lots of birds. We went from one extreme (too few birds to count) to the other (too many birds to count). Actually, though, this became a great way to talk about a skill that scientists use every day - estimating population size. For example, a marine biologist may need to estimate the number of red algae in a given area of the ocean in order to investigate food scarcity and the survival rate of sea urchins. Similarly, a molecular biologist may need to estimate the number of cancerous cells in a tissue sample treated with different medications. A traditional way to make estimations is to divide up an area or volume, count the number of items inside one of the divisions and then multiply the number counted by the number of divisions. This is better shown visually. In the example below, a 4x4 grid of 16 squares is laid over the housing development pictured. 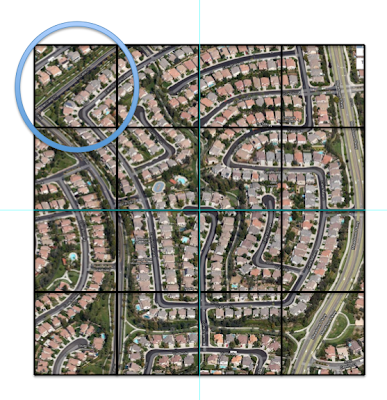 To estimate the number of houses shown, count the number in one of the small squares, then multiply that by 16. I counted 20 houses in the circled square x 16 is approximately 320 houses in the picture below. Yes, you could count each and every house (at the risk of giving yourself a headache) but its much faster and easier to make an estimate of the population size. To estimate the population of the birds at the lake, we employed a somewhat different method using the idea of counting by 10s. We picked a small area of the water and counted 10 birds. 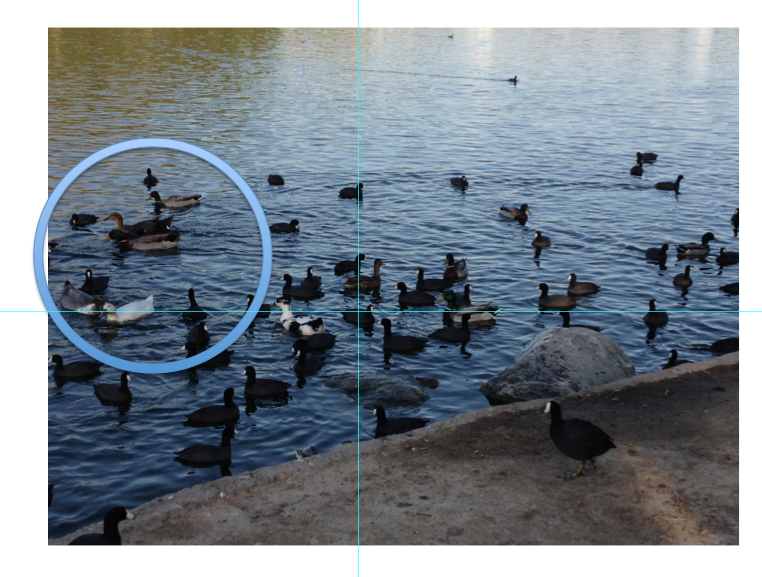 Then we made a guess as to how many more circles of birds we could draw on the lake. Using the picture below as an example, there are 10 birds in the blue circle. We estimated that we could make about 5 more circles so in total we estimated that there were 60 birds. Note: In the picture there are two different kinds of birds. The small black ones with white bills are American Coots and they actually aren't ducks at all; they are more closely related to chickens which you will immediately see when they get out and walk on land! The larger black and white ducks are either Muscovy ducks or Muscovy x Mallard hybrids, I think. There were much fewer of these, so we counted them separately and then used the estimate we found for the American Coots. Missed the Count this year? You can submit observation data any time of year at eBird that will be used to track bird populations by scientists all over the world. Citizen science is so cool!